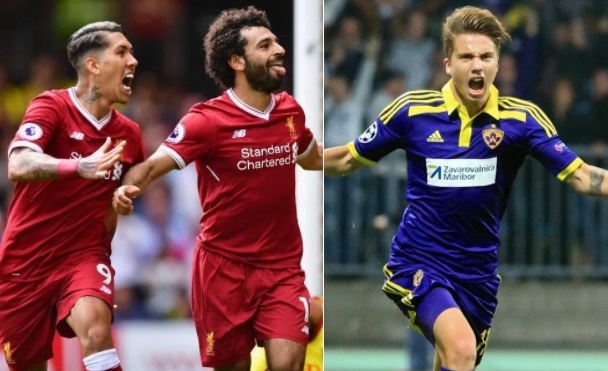 Liverpool host Slovenian side NK Maribor for the Champions League matchday 4 game on Tuesday night, 31th October 2017 at the Anfield stadium in Liverpool. Having drawn 2 and 1 win against Maribor couple of weeks ago, Liverpool can take a giant stride towards qualification to knockout stages with a win on Tuesday night. Anything but a win will put their chances of qualification from this group in kind of jeopardy which makes it a important game. It kicks off at around 20:45 CET / 19:45 uk time and we will have live links closer to the kickoff. 04′ 0 – 1 Roberto Firmino opened the scoring in just 4th minute which lead to a flood gate as Liverpool run riot. 13′ 0 – 2 Philippe Coutinho made it 2-0 minutes later as Maribor were no match to dominant Liverpool. 19′ 0 – 3 Mohamed Salah got himself on the scoresheet and scored Liverpool’s third. 54′ 0 – 5 Roberto Firmino made it 5-0 just after the halftime break and Jurgen Klopp started to ring changes. Team News & Lineups: Maribor are a decent side specially at home, they will be compact in defense and resilient to frustrate Liverpool hoping for a break at the counter. However Liverpool’s weekend performance against Manchester United was pretty solid as they dominated the game and created more chances without conceding. Klopp was upbeat about the performance but not so much about the result. He knows, Liverpool must go on some sort of winning streak from now to have some sort of chance regarding silverware this season. Loris Karius is set to start in goal for Liverpool inplace of Simon Mignolet who kept a clean sheet against United. Jurgen Klopp refused to comment of any more changes in the starting XI and considering Liverpool’s position in the group, he is likely to start with unchanged side which took the field against United. Sadio Mane is still out while Sturridge is not enough match fit to start. Firmino, Salah, Coutinho to start upfront with Ox-chamberlain to play in central midfield. This is how I expect both teams to lineup on Tuesday night. Confirmed team news is available shortly before the start of the match. Match Predictions: Liverpool will be favourites going into the game on paper at least but their form suggest they might well be in trouble on tuesday night. We expect a unchanged team from United’s clash which should have enough about them to get a result here. There might be just one goal in this game and that will be enough to get three points for either side. I am going with a narrow 1-0 away win for Liverpool which will put their qualification hopes back on track.